← Barbara Arntsen. High on the Hog: A Peri Mason Mystery. United States: CreateSpace, 2012. Margaret Maron. The Buzzard Table. New York: Grand Central Publishing, 2012. It’s hard to believe that the war on terror has come to Colleton County, but that’s what PAT–Patriots Against Torture–thinks. Its members believe that the county airport is being used to fly terrorism suspects out of this country to secret prisons in Europe where they will be tortured. As this novel opens, Jeremy Harper, a local high school boy in the group who trespassed at the airport, appears in Deborah Knott’s court to answer the charges against him. Because Jeremy does not have a record, he is given community service time. He will use his talents as a photographer to document the stories of local veterans. His activities will be directed by a local minister and Anne Harald, a noted photojournalist who is in town to attend to the needs of her dying mother, local grande dame Mrs. Lattimore. Anne Harald is the mother of NYPD detective Sigrid Harald, who has also come to Colleton County to be with Mrs. Lattimore. 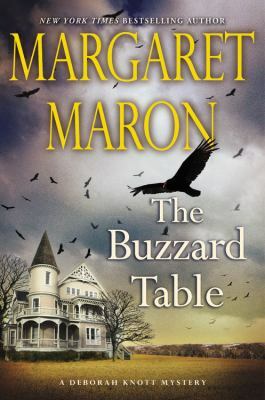 Even though Mrs. Lattimore is fading fast, she insists that the family entertain a long-lost nephew who is in the area doing research on buzzards. Against her will, Deborah is roped in to dining with the Lattimore clan. Deborah has already met the nephew and has been put off by his bad manners and excessive desire for privacy. Later, when an attractive realtor is murdered and her body dumped near the birder’s research site, Deborah is suspicious, as is Sigrid. But this is a case for the county sheriff, and Deborah’s husband, sheriff’s deputy Dwight Bryant, suspects that a jealous husband or spurned lover committed the crime. The murder of a stranger at a local motel sets both Dwight and the reader to ponder whether the two murders are connected. While Dwight works on the cases, Deborah keeps the home fires burning, cementing her relationship with her stepson Cal. As the novel ends they are more a family, even as Deborah realizes that there are things about Dwight’s past that she does not–and may never–know.